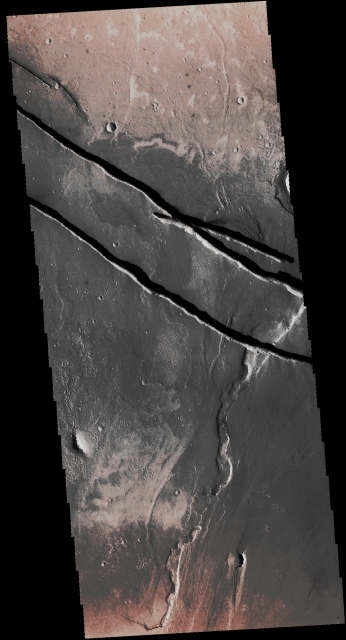 In this nice VIS image, taken by the NASA - Mars Odyssey Orbiter on April, 10th, 2016, and during its 63.541st orbit around the Red Planet, we can see - for the second time, on these pages - a small portion of the Martian Region known as Cerberus Fossae. Cerberus Fossae is a truly large group of (sometimes also intricated) Graben, that is located near the Southern Portion of Tartarus Montes. The so-called "Graben" (---> the same for both sing. and plur.) is/are Faults bounded Blocks of Material that have shifted downward along the Faults' Faces. As a matter of fact, the Cerberus Fossae System litterally cuts through the Hills known as Tartarus Montes, which means - as you should know - that the Montes formed first, and then the Fossae came (---> formed) later (for still not fully well understood Geological reasons - even though the Volcanism could/should have played a big role in their formation). This image (which is an Original Mars Odyssey Orbiter b/w and Map Projected frame published on the NASA - Planetary Photojournal with the ID n. PIA 20630) has been additionally processed, magnified to aid the visibility of the details, extra-contrast enhanced and sharpened, Gamma corrected and then colorized in Absolute Natural Colors (such as the colors that a normal human eye would actually perceive if someone were onboard the NASA - Mars Odyssey Orbiter and then looked down, towards the Surface of Mars), by using an original technique created - and, in time, dramatically improved - by the Lunar Explorer Italia Team.